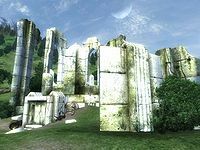 Vilverin is a large Ayleid ruin northeast of the Imperial City containing bandits and undead (quest-related). It contains four zones: Vilverin, Vilverin Canosel, Vilverin Wendesel, and Vilverin Sel Sancremathi. This ruin can be entered, fully explored and all items retrieved without starting the related quest. Selling the Ayleid Statue found in Vilverin is one way to start the quest. There is an Ayleid Well right next to the entrance, which will supply you with some potentially useful extra Magicka. There are a couple of unofficial storylines present in Vilverin. On the second lowest level of the first area of the dungeon, it is possible to become trapped behind the two planks standing against the wall. You can walk into them easily, however it is impossible to walk out. 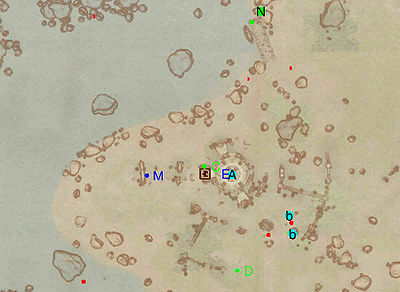 Although this ruin appears to be on an island on the game map, it lies on a peninsula. On the bed in the room containing the dirty note and Welkynd stones there is a nearly unreachable dagger hidden under the pillow. It is easiest to obtain with a cheap ranged spell. Vilverin appears in ESO as Lake Mist Ruins. There are supposed to be 11 iron arrows at the camp near the entrance. However, two of them fall through the ground when the cell is first entered and are rendered inaccessible. This location's map marker (M on map) is named Vilverin (editor name VilverinMapMarker01). The entrance door is E of the marker, 60 feet away. In the first zone of the ruin you will only encounter bandits. These bandits are all relatively weak, being about two levels lower than bandits anywhere else in Oblivion; see Bandit for details. To the south of the main room you will find a Dirty Scroll written by the bandit ringleader with some background information on their activities. It also mentions that two bandits, "Two-Coins" and a "Khajiit from Vvardenfell", chose to camp in the tombs, and the Khajiit has gone missing. The bandit's note also mentions blue stones found in the ruin, which are actually Welkynd Stones; they are common in Ayleid ruins and may be placed as another type of introduction here, as Vilverin is the first dungeon the player sees upon exiting the sewers. There is a trap both on the first stairwell and the entrance preceding it. 7 Welkynd Stones. One is on the floor, just south and east of H; the other six are at a. 9 Stone Bricks at the bottom of the second stairwell. Some rare but useless stone bricks that can be placed in your inventory can be found in one of the stairwells. 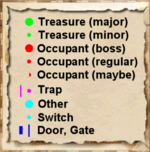 The second zone appears at first to be a dead end with one lone bandit; presumably "Two-Coins" mentioned before. However, there is a Hidden Door at point N that leads to the rest of the ruin, as well as the dead body of the unfortunate Khajiit. It is at this point where you will begin to encounter undead, rather than Bandits. To proceed you can unlock the locked gate at L or find the secret passages (starting at M) that bypass the gate. If you use the secret passages, be sure to also explore the pool of water in the large room. There is one small Ayleid Cask in the water, and there is an underwater entrance to the room that gives access to the rest of the zone. This is the entrance that would have been used had you not chosen to circumvent gate L in the first hidden chamber. At the top of the stairs located in the underwater entrance is an additional stairwell that leads down into an area with several enemies, some of which are locked in gated rooms (G, H, I, and J). Some, but not all, of these rooms contain loot. 2 Welkynd Stones. One is on the floor by the cyan dot near K and the other is high on a pedestal in the easternmost part of the northeasternmost area (near gates H and J). The first larger room that you will encounter has a Spike Pit trap (T) that may be used to injure your enemies if you can lure them onto it. It will also harm you if you are struck by the spikes. In the southern large room you will find a set of glowing blue blocks that you can press to activate. 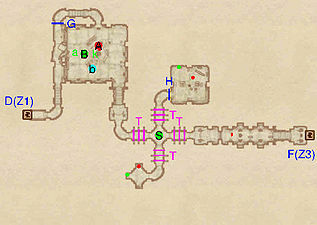 Each block is connected to one of six side passages (H, I, J, L, M, and N), every one of which contains an enemy except for one; the upper-rightmost block will lower a door (H) that is protecting an Ayleid Cask with the key to the exit gate. Also note that walking through the entrance-way will lower the gate at G and seal off the entrance to this room. The gate will open after entering the hallway leading to the last room, which contains a closed Varla Stone Cage. To open it, you need to find the activation block, which is on the overlooking balcony. 1 Varla Stone (in a Varla Stone Cage) at location V on map. The activation block for the cage is on the overlooking balcony to the south of the room (cyan dot on map). 11 Welkynd Stones. 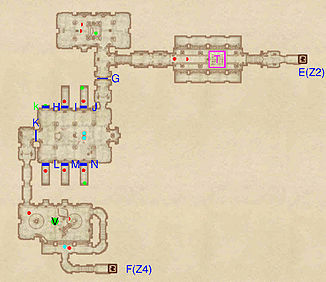 Six are on pedestals in the first large room with Spike Pit trap (T), four are the northwesternmost room, and one is in the east alcove of the room with 6 hidden doors. 1 Iron Gate (opened remotely) at G. This gate is initially open, but will close as soon as you enter the room containing the gates at H, I, J, L, M, or N. It will reopen shortly after walking through gate K.
The room at the end of the entrance corridor is shaped like a "plus" sign and hosts a set of Swinging Blade traps in each corridor. The timing of these specific Swinging Blades does not vary. In the center of this room is an Ayleid Statue (S), which is important for the quest The Collector. 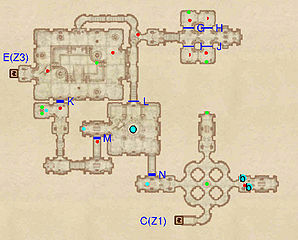 While the two side rooms (located through the northern and southern corridors of the "plus") contain both enemies and loot, the western corridor leads to the climax of Vilverin's "story", which is the headquarters of the necromancer Jalbert. By the chest located on the pedestal you will find an Undelivered Letter. It seems that Jalbert fled his native Daggerfall when his necromancy was discovered and was only able to escape because he was a good friend of a city guard (the person to whom he was sending the letter). The letter also suggests that Jalbert either killed or took advantage of the death of the Khajiit bandit to further his necromancy experiments. 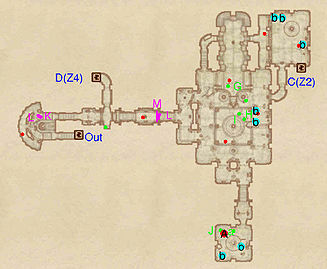 The exit of this room is supposed to only be accessible by opening the locked gate at G (the key to which is at k, on top of the pedestal chest); however, there is a broken area of the wall that can be climbed to bypass the gate. This page was last modified on 25 March 2018, at 03:18.